You are here: Home › Entries tagged with "VBA"
This collection allows you to work with a variety of subordinate objects, change properties, and run methods for manipulating workbooks. Further it allows you to add new, open, save, close the workbooks… It also enables the opening of external links, document protection and all other operations to control workbooks in order to improve the experience of working in Excel. 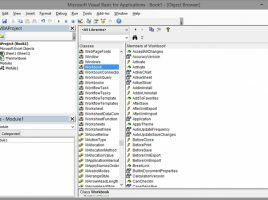 Application object is the highest by hierarchy among VBA Excel objects. It has a host of subordinate objects as well as about 170 properties that can influence application behavior. Objects generally have many properties and there is no need to remember each one of them, we should only remember the most important ones that we will use in our day-to-day work. 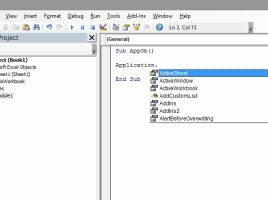 The following is an overview of the most important properties of the Application object. Before we begin to use forms we need to initialize them. This means adding a set of values to the controls and setting the default values. Initializing values is done in the subroutine from which we start the the Form. 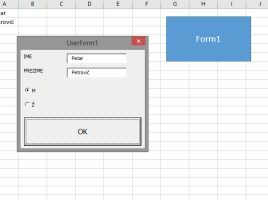 Show method to display the form. After it opens, the user will be able to enter the desired values, and most importantly, it will be able to select the values instead of always input them as plain text. 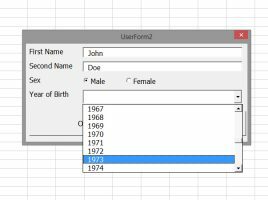 Forms are graphic objects that are created by the designer, and they consist of a variety of controls for easier data entry. These may be: text input field, radio buttons, check boxes, drop-down lists, combined lists, etc. By adding control to the mask, prerequisites for retrieving values into a document ​​are created, and after the scheduled action they are imported on specific location within a worksheet. 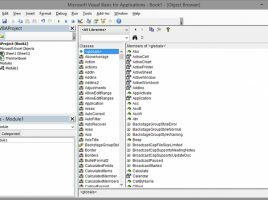 VBA uses objects to control Excel behavior so if you want to master this programming language and make the most of it you need to get acquainted with objects and collections, as well as with their properties and methods. In this text, I will introduce you to the most frequently used Excel objects: Application, Workbooks, Worksheets, Cells … In some of the following articles, we will deal more closely with each of them.